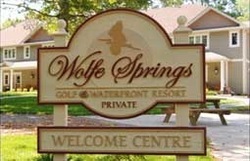 ​​​A CanAssist supporter has offered by silent auction one week accommodation at the Wolfe Springs Resort in Westport Ontario. This two-bedroom unit that comfortably sleeps up to 8 will be available from Friday July 28 to Friday August 4 . The usual summer rental rate for a unit at this resort is $2500 but we are offering it by silent auction to the highest bidder as of 9 pm on Wednesday April 5, 2017. Proceeds from the auction will go to the CanAssist African Relief Trust. A win-win situation for your family and CanAssist. The professionally designed and maintained villa offers pure relaxation in well-appointed luxury. The open-concept floorplan includes a gourmet kitchen with wine cooler, great room with fireplace & flat screen tv and a master suite that comes complete with a soaker tub, gas fireplace and a stunning view from the private balcony. The unit offered is on one level on the second floor of the building - easily accessible by stairs or elevator. It is non-smoking and no pets, please. Your Friday to Friday week at this luxury resort will include use of all common area amenities including canoes, kayaks, paddleboat, docks, horseshoe pits, golf carts, outdoor BBQ & fireplace area, Boathouse, Fitness Room, Games Room with a pool table & shuffleboard and a Movie Theatre Room (with 22 theatre chairs). 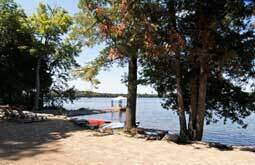 There is a sandy beach area for swimming and the beautiful village of Westport is close by. You can read more about the resort here. A voucher for the week's accomodation at Wolfe Springs will be issued to the highest bidder as of 9 pm on Wednesday April 5, 2017. Your name will not appear on the auction page. Bids must increment by at least $10 to qualify. Be sure that your email submitted email address is correct as it is how we will contact the winner. If, for some reason, the highest bidder declines to take the offer, the next highest bidder will win the auction*. Good luck! Bids that do not include contact information will be removed. *The successful bidder will be required to make an immediate deposit of half the agreed-upon bid with the remainder due on occupancy of the unit.